EVO 6 / 4G63 - re-torque of OEM head bolts possible? lately my head gasket is leaking oil to the front of the engine. Behind the exhaust manifold in the area of the 1st Cylinder. I did a compression test and internally the engine seems to be fine. (1350, 1310, 1310, 1310 kpa) No water in oil and vice versa. Also the amount of oil its leaking is small, but noticeable on the dipstick. Worst case I will have to replace the head gasket, but if possible I would like to try what has been recommended to me: Re-torque the head bolts. I know the OEM head bolts for the 4G63 are stretch type. So general question here is, is it even possible to re-torque such bolts? Some say yes, with about 100Nm and circle pattern (inside-out). Is that true? What I can tell you, purely from my experience of being a customer of an engine builder on multiple occasions, is that a head would be torqued initially and then re-torqued after a relatively short period of usage. Whether this is the optimal approach, or simply the chosen path of my particular engine builder, I really don't know. And I have also known a head be re-torqued if signs of head lift if have detected (which generally showed as cylinder pressure leaking into the cooling system ie rather than in any way oil related). But that was more as temporary measure to get through an event rather than as a long-term fix. Car: Highly Modded E6 T04Z/2.2ltr, E91 325D Ohlins/M3 bushes, Renaultsport Megane RS250 Cup. 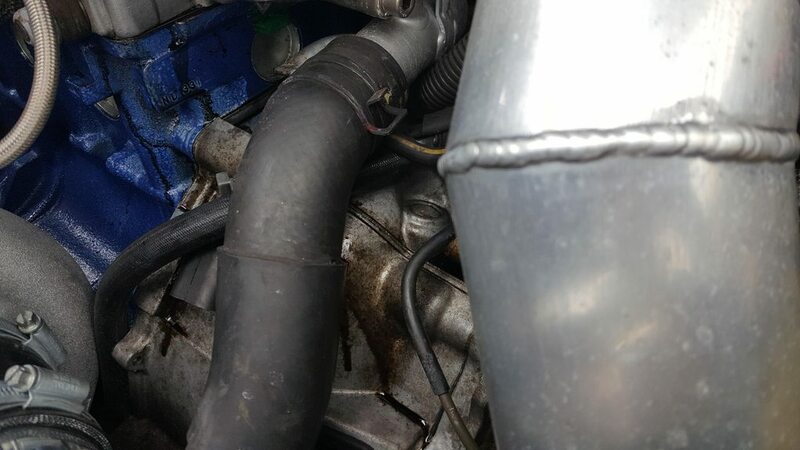 It sounds like one of the exhaust manifold studs has lost it’s seal, these encroach into oilways in the head, so if the sealant fails, it will leak oil. I’d remove the studs around the area of the leak, deagrease the internal thread, and re-fit the stud with high temp sealant. Clive is spot on. Here's what my stud leak looked like. Oil seems to make its way around the gasket line and make it look more serious than it is. A couple of my studs are quite loose and it needed a good wrap of ptfe (plumbers) tape plus sealant to stop the leak. New studs are a good idea too. Or should new studs already be fine without the sealant? Just to get back to topic. In case my stud seals are fine I would still go and try the re-torquing before getting the engine torn apart. I was recommended to use 100Nm for re-torquing as the angle torquing can not be applied. Can anybody comment on this? Is this a thing? No, we’re all making it up to give you the run around. Please don’t insult us. We are discussing the topic of the oil leak and the most likely cause. You said comp tests are fine, so why do you want to ‘tear the engine down’ ? If I were you, I’d remove the exhaust studs, degrease the threads in the head, then re-fit, coating the threads in red RTV or Loctite 5990 or similar. I wouldn’t touch the head bolts until you know the head gasket is the cause, and even then, if it is, you’ll want to fit a new gasket, so a re-torque of the head bolts is mute. A final note anyway - the standard head bolts cannot be further tightened once fitted, you need to remove, check they have not permanently stretched (nominal length 99.4mm), re-oil the threads, then re-torque and tighten another 180deg. Last edited by Clivew; 27-03-2019 at 16:58..
anyways, thx for the extra info. So I know now that just re-torquing without pulling them might cause more issues than provide a solution. An additional question regarding that: Can you pull one by one or could this cause head warp or leakage and then I'd have to pull the head off anyways? I read people switching to ARP have done it one by one but it sounds scary to me. Yes, remove and re-torque one by one, in the same order as the original torque pattern, nothing will warp I can assure you, as only one bolt is loose at a time.